The show brings toy enthusiasts from throughout the Midwest to buy, sell, trade and just plain enjoy the collections and displays. There will be farm and construction toys, along with trucks, cars, crafts and much more. Door prizes will be awarded throughout the show. Admission and parking are free, although donations will be accepted. The show will be held in the air-conditioned exhibit hall at the fairgrounds. Minneapolis Moline Pedal Tractor to be given away. Donate to the Youth Fair for your chance to win. (Need not be present to win). For information, contact Robin Mizell at 618-645-2737 or mizell.rc@gmail.com, or Tammie Obermark at 618-534-3376 or tamgo74@gmail.com. More info about Massac County Youth Fair. This entry was posted in All the Buzz - Bee Informed and tagged Massac County Fairgrounds on June 18, 2018 by massacbeeswax. The Youth Fair booklet is available at the Massac County Farm Bureau, 1436 W. 10th Street in Metropolis. Registration form to enter livestock and exhibit hall items is in the booklet. Exhibitors are requested to send in registration forms by July 1st so that an adequate amount of space for animals and exhibits can be assured. Theme this year is “200 Years of Agriculture in Illinois” in honor of Illinois’ Bicentennial. You can enter up to two entries per class this year. 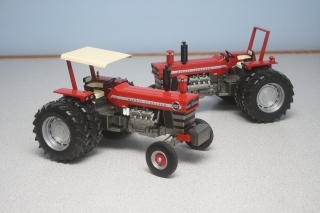 Farm and construction toys, trucks, cars, crafts, and more. Free admission, donations accepted. to be given away. Donate to the Youth Fair for your chance to win Minneapolis Moline pedal tractor. For details, click here. Tractors – Implements – Engines – Horse-drawn Tools. No admission charge, donations accepted. Tractor games, fun activities and food. Parade on Saturday at 6 p.m. through town and Sunday at 2 p.m. on fairgrounds. For details, click here. This competition consists of two-member teams that compete in three brackets: Beginners (5 and under), Intermediate (6-9), Juniors (10-13), and Seniors (14 and over). Juniors and Seniors compete in four activities. The contest is held in the Horse Arena. Cash award will be given to 1st, 2nd, 3rd and 4th place teams in all brackets. Spectators welcome. No entry fee. This entry was posted in All the Buzz - Bee Informed and tagged Fair, Massac County Fairgrounds, Youth on June 18, 2018 by massacbeeswax. Come see the tractors, implements, engines, horse-drawn tools and more. Featured this year is Minneapolis Moline, but all makes are welcome and will be represented. Free admission however donations are accepted. Kiddie Pedal Pull: Registration at 12:30 p.m. Pull begins at 1 p.m. in the barn. Tractor Judging with plaque: 5 p.m.
Tractor Show: 8 a.m.-3:30 p.m.
For tractor show information, contact Darryl Korte at 618-638-7412. This entry was posted in All the Buzz - Bee Informed on June 18, 2018 by massacbeeswax. This entry was posted in All the Buzz - Bee Informed on June 13, 2018 by massacbeeswax. This is the 6th Annual National Championship. Students will have the opportunity to compete against S3DA members from across the United States for the title of “National Champion” in their division. Registration per student will be $30.00 thru June 14th, 2018 which will include access to the practice bags and a free T-shirt. Late registration (after June 14th) will be $60 per student. For information and registration information visit website. There will be a one time entry fee of $25 and archers are eligible to shoot once each day. The ranges will change daily with shooting times from 9 am – 3 pm. Combined prize money for the professional and amateur classes will be over $20,000. Sponsored by the Greater Metropolis Convention & Visitors Bureau, Illinois Department of Natural Resources and the City of Metropolis. Website. The Greater Metropolis Convention and Visitors Bureau is proud to welcome back the ASA Shooters Over 2100 competitors attended the 2017 event and they are planning for even more this year. Metropolis Tourism website. The Archery Shooters Association Pro/Am and Federation competitions include a standardized set of competition rules; professionally executed shooting ranges; high standards for dress and conduct; safety standards that include a maximum arrow speed standard of 280/290 feet per second; the copyrighted 12-ring and 14-ring scoring system; and the largest paybacks in competitive 3-D archery. ASA 3-D archery features competitive rounds of lifelike, three-dimensional animal targets made of foam. The scoring rings are not always visible from the shooting stake and binoculars are allowed. Advanced archers must determine the distance to the target, pick a good aiming point, and execute the shot. Ranges will be set to meet qualifications for the specific classes. Shooters will be categorized based on their current ASA Classification. Children are welcome to participate so there will be fun for the entire family. Spectators can watch for free. Food vendors on site include Hickory Hog BBQ, Bear’s BBQ, Montego’s Catering & Concession, and Dippin’ Dots. To register, visit ASA website. For more information call 618-524-5025. This entry was posted in All the Buzz - Bee Informed and tagged Archery, Mermet Lake, Superman Celebration on June 12, 2018 by massacbeeswax.